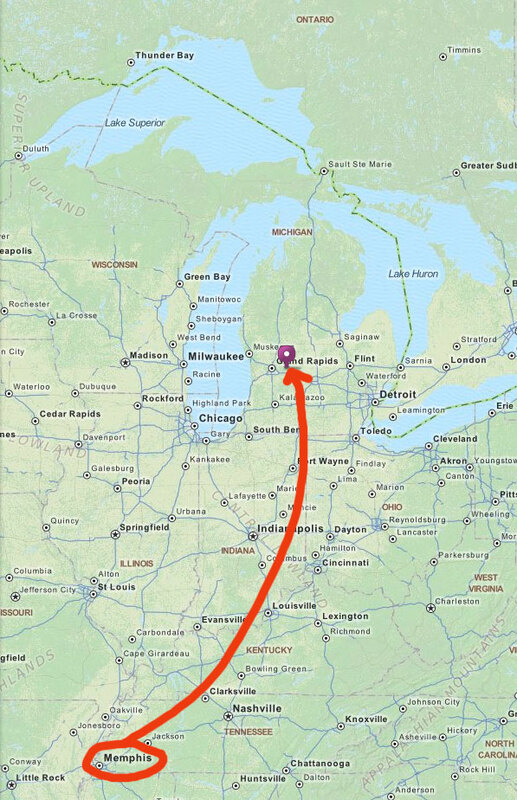 Today I am traveling to Peacock Alley Needlepoint in Ada, Michigan for 2 days of Canvas Enhancement classes: August 1 & 2, 2014. Blog readers will remember all of the good times I had there last year. I'm so fortunate to be asked to return again. This time there were 9 stitch guides to write, and Peacock Alley Needlepoint has pulled the threads. 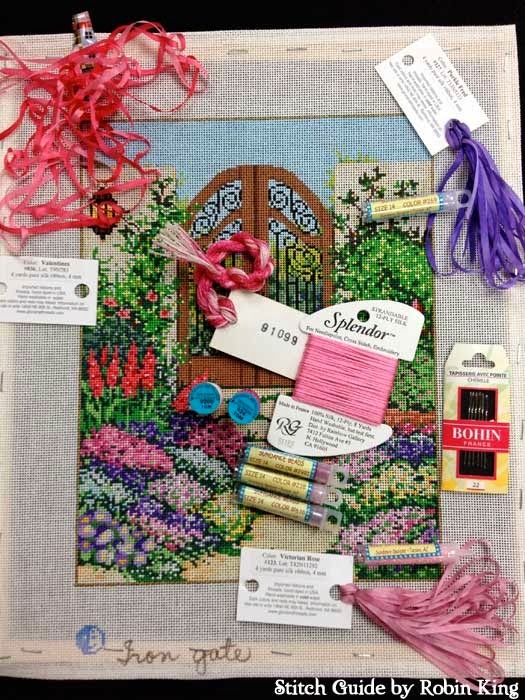 We will have two days devoted to stitch development and all things for the love of needlepoint. 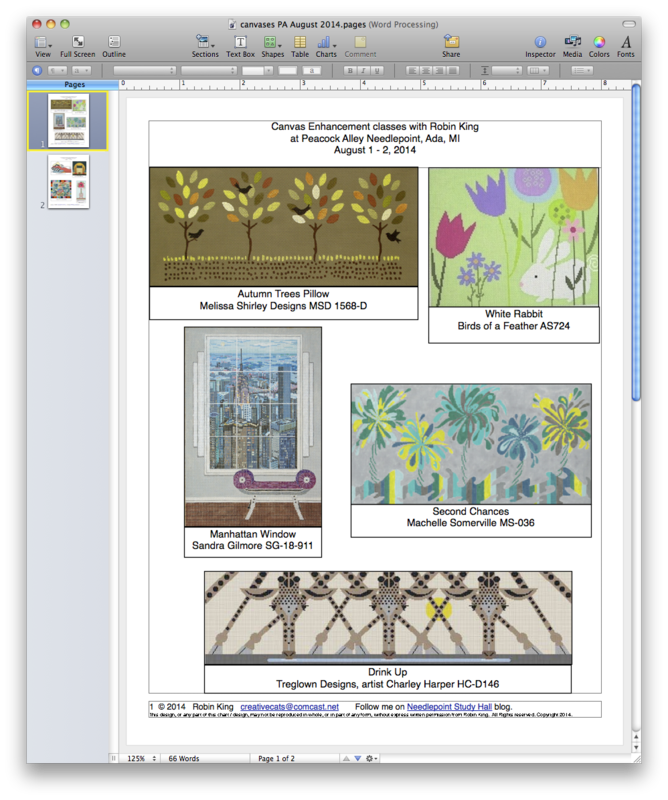 There are two Melissa Shirley canvases, as well as a Machelle Somerville canvas, a Melissa Prince canvas, a EWE & Eye canvas, a Sandra Gilmore canvas, a Charley Harper canvas, a Birds of a Feather canvas, and the classic Lee's Needle Arts canvas. Quite a wonderful assortment. 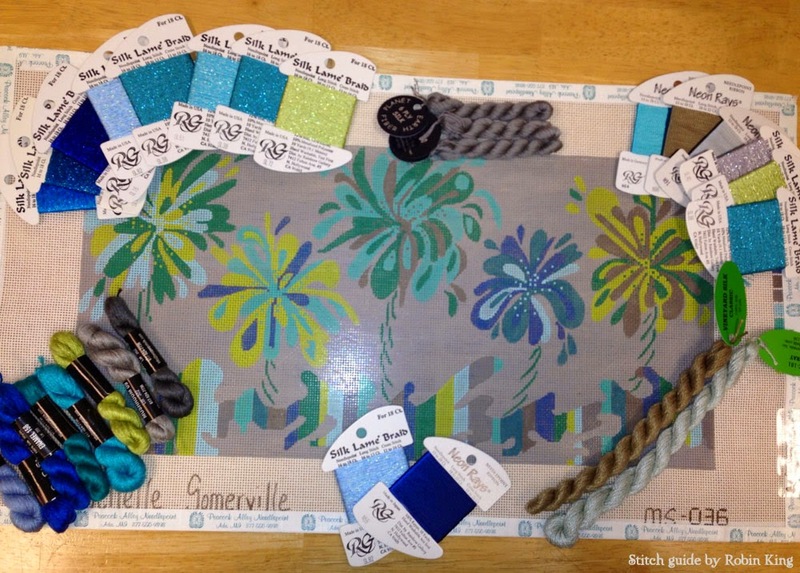 Look at the colorful threads pulled for "Second Chances" by Machelle Somerville. There will be beads added for a little bling, too. Pretty Peacock-y colors, wouldn't you agree? Machelle is the General Manager at Peacock Alley Needlepoint, as well as one of the hottest designers in needlepoint today. You can see her canvas line at Fleur de Paris. I will take photos and will post them upon my return. It is fun seeing these canvases come to life. 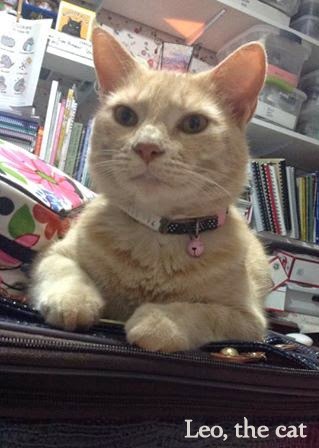 Leo, the cat, wanted to say hello. He's the best suitcase-packing helper. "Potluck" by Charley Harper and Penny B.
Penny Boswinkle was in my recent class at The Nimble Needle-Atlanta. It was good seeing her again. We do have fun in class. Bouncing stitching ideas off each other. I can honestly say I learn from her, too. Penny is also fearless; shutters from no stitch, thread, or canvas mesh... she even stitches on black. In April 2014, Penny selected a Charley Harper canvas called "Potluck" for her canvas enhancement class. The canvas features an animal interested in some pottery... and lots of black for the night sky. I wrote the stitch guide, and Penny took off like a trouper. So in July 2014 (yes, last week), Penny brought in her finished (!) "Potluck" from the April 2014 class. That's 3 months, folks! I am beyond thrilled with the results. When I was writing the stitch guide, I had a "hmmm.... I wonder..." moment. I did some research to see what kind of animal the Coatimundi was. 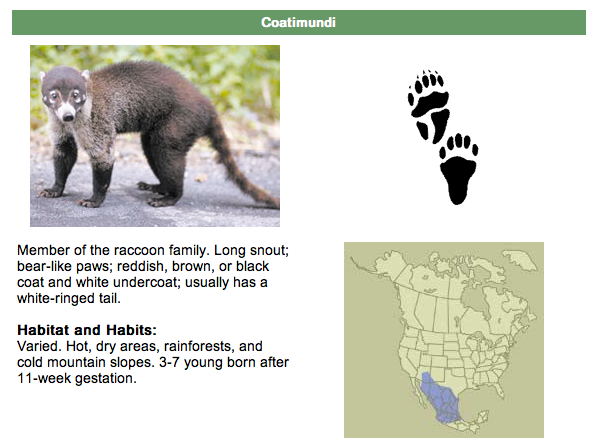 Thanks to the internet, I was able to find some information about the Coatimundi and noticed his foot prints. I thought to myself: they MUST be incorporated into the background. I found the perfect Brenda Hart background for visual interest. Doing the happy dance, I then charted the foot prints and included them in the instructions. Hopefully the stitcher would see my vision. 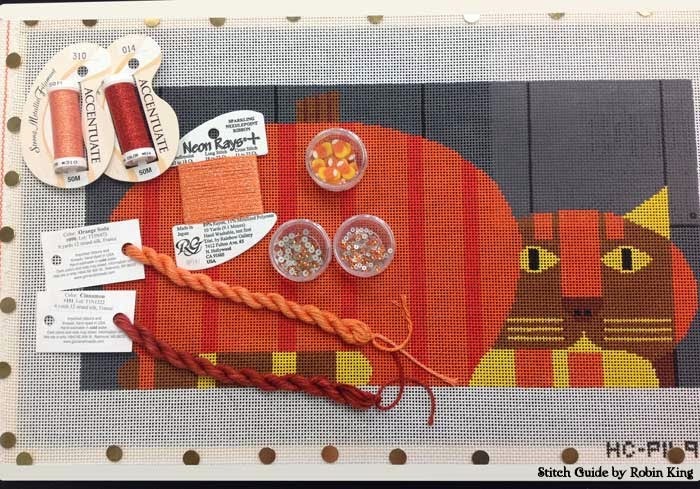 So, in the April class, it was Penny's turn for the stitch guide consultation. (I almost couldn't contain the secret.) Penny read through the guide. She stopped and looked at me. I looked at Penny. We both burst with glee! Beaded FOOTPRINTS! Oh, how fun. To date, "Potluck" is one of my most favorite Charley Harper pieces. The man was brilliant. So without any further fanfare... 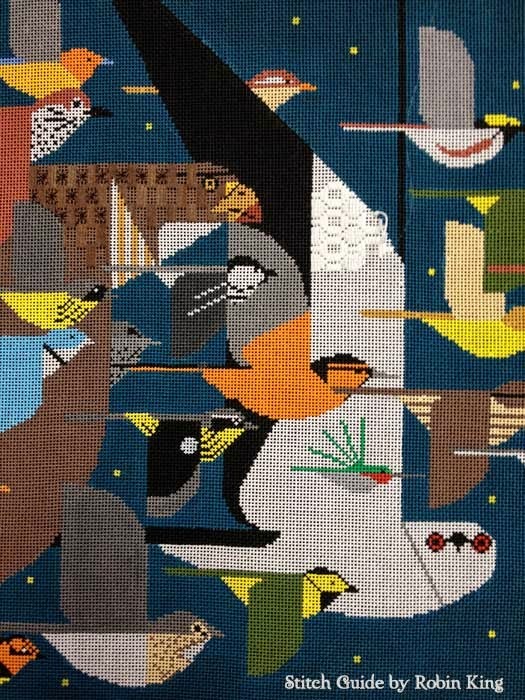 I present "Potluck" by Charley Harper (HC-P102); expertly stitched by Penny Boswinkle. 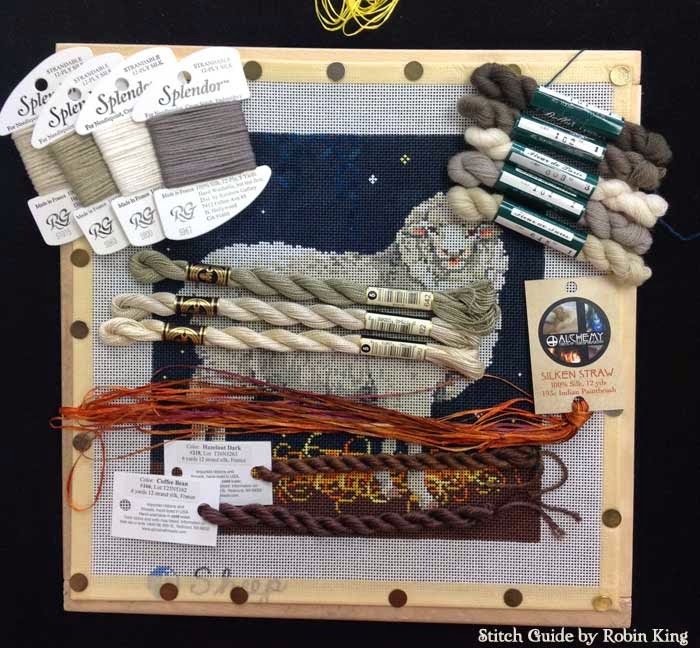 Stitch guide available from Robin King. Thanks for letting me share this story. Special moments, indeed. Well that's it for now. I'm getting ready for another teaching destination: Peacock Alley Needlepoint in Ada, Michigan. See you there. Sorry (again!) for the long silence. 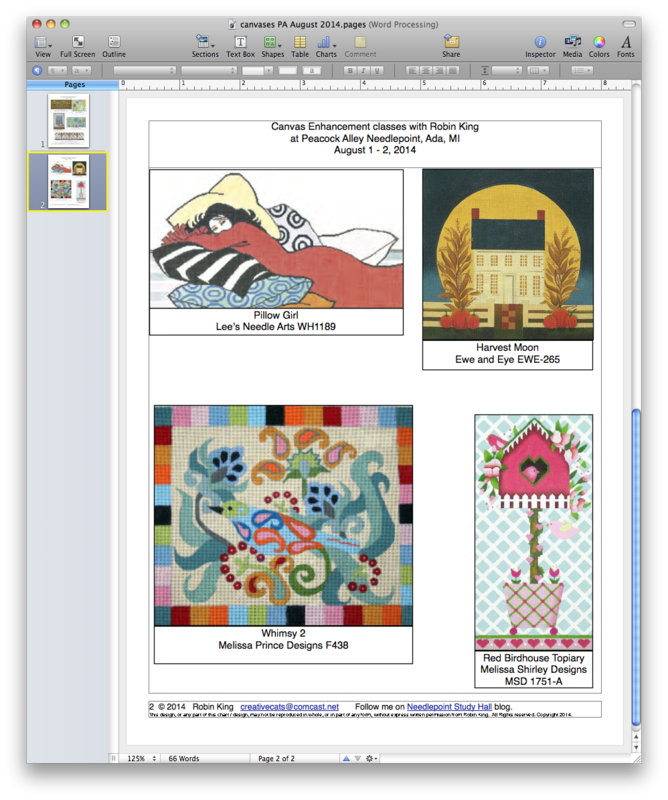 Since last we chatted, I've traveled to The Nimble Needle-Atlanta and taught 3 days of Canvas Enhancement classes. This time there were no pre-written stitch guides; just coming up with threads and stitches on the fly. What a fun time we had. Here are just a few of the 18 canvases with their thread selections which were at The Nimble Needle-Atlanta. 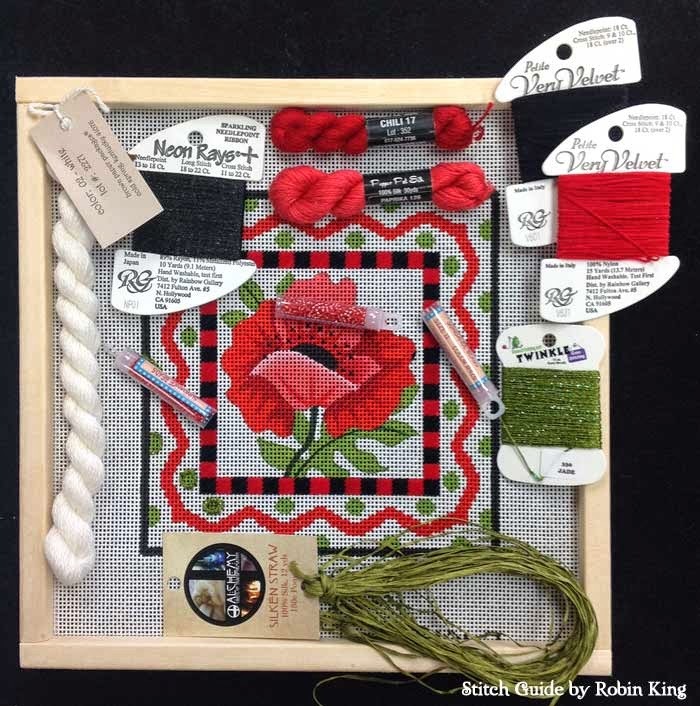 Once stitched, "Poppy" by Amanda Lawford (AL 1867) is going to be applied to the outside of a Black Travel Tote. Very stylish, Eloise. 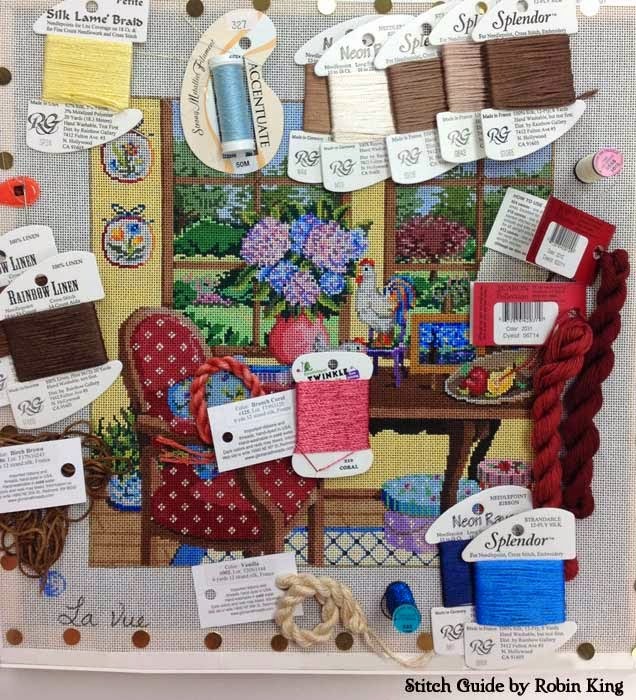 Peg is going to have the best time stitching this Sandra Gilmore canvas, "La Vue." Sharon won the Travel Trophy. She lives in the Orlando area and drove to Atlanta to take the class. I was truly honored! She brought one of my favorite canvases by Charley Harper, "Pumpkin Cat" (HC-P169). Barbara was all prepared to do endless French Knot and Colonial Knots for the entire "Sheep" (by Sandra Gilmore) until I gave her a different approach for the Sheep's Body. We will save those stitches for the Head area; will also do the Gathered Stitch... one of my favorites. 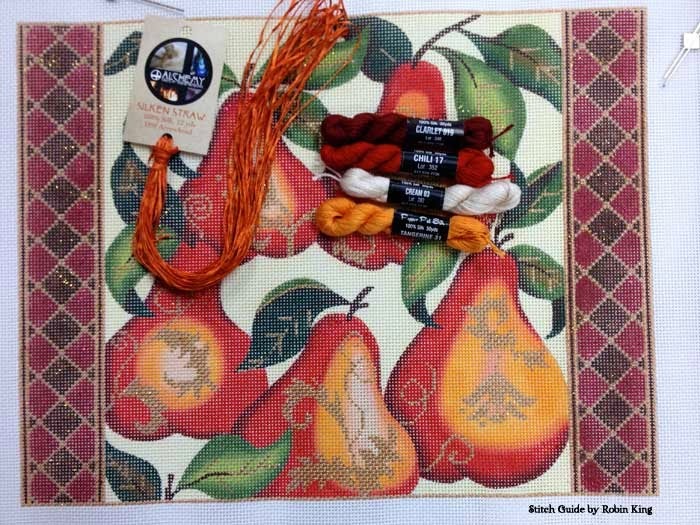 Becky's new tray is going to be Fab-ulous once the "Red Pear Pillow" by Alice Peterson (AP2445) is stitched. We have her well on her way for Pears, Leaves, and Background stitches. Jean selected a new canvas from Hilary Jean Designs. 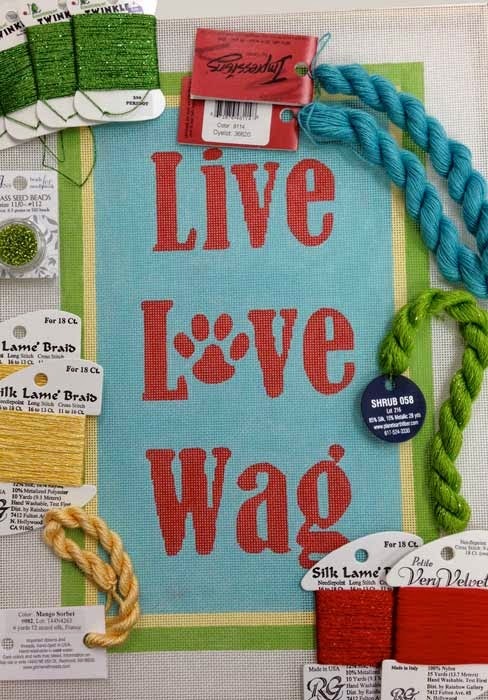 We had fun selecting backgrounds and other stitch areas. Taffy will become Atlanta's newest Silk Ribbon expert as she works through the "Iron Gate" by Sandra Gilmore (SG-18-606). Last one in our review, but no means the least, was Jenne's "Mystery of Missing Migrants" canvas by Charley Harper (CH-M101). First, we established an over-all wing approach for the smaller birds. Then, we discussed some background options. Finally, we tackled the big guys in the front of the pack. Every visit to The Nimble Needle-Atlanta is a joy and pleasure. Looking forward to returning this fall. See everyone in October.